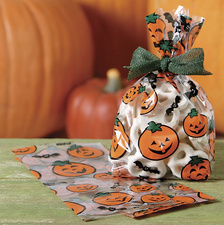 Present your Halloween treats with a special and unique touch with these Halloween Treat Bags. Make sure those little monsters knocking at your door would blush with delight as they reach out and see that your treats are especially wrapped in these cute and transparent cello bags. These beautiful bags are a practical gift to give to any householder who is busy preparing for the Halloween party and the trick and treat gift bags.